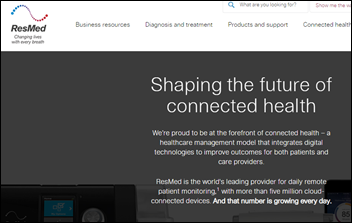 Sleep apnea equipment and connected health vendor ResMed turns in Q2 results: revenue up 8 percent, adjusted EPS $1.00 vs. $1.00, meeting earnings estimates but falling short on revenue, sending RMD shares down an alarming 19 percent on Friday for a market cap of $13.5 billion. They’re down 8 percent in the past year vs. the Dow’s 6 percent loss, but have more than doubled over the past five years. The company’s recent health IT acquisitions include Propeller Health, HealthcareFirst, MatrixCare, and Apacheta. It also acquired Brightree in 2016. 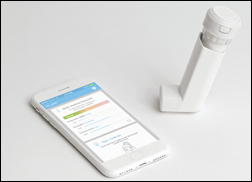 ResMed said in the earnings call that the Propeller Health acquisition gives it a big footprint in the management of high-cost lung disease and also ties in well with ResMed’s at-scale digital health for sleep. The company will spend $7 million per quarter to fund its joint venture with Verily to identify and enroll sleep apnea patients. From Stat of the Onion: “Re: readership. My co-worker and I have a bet on the number of visitors you get on HIStalk.” It runs about 1.8 million unique visits per year, although my vanity requires me to say that I intentionally don’t publish in ways that would boost the numbers in a misleading measure of influence (more frequent posts, individual articles instead of one summary, etc.) I rarely look at the stats and thus am not tempted to use reader-unfriendly gimmicks to increase them. From Blast Furnace: “Re: Facebook. What happened to your page? Did you change pages or just stop updating it? Can I only see your posts on your website now?” I was using Facebook and LinkedIn only as a cc: for tweets indicating that I’ve published something new, but my third-party tools that made it easy kept breaking because these vendors are always fighting against apps they fear will rob them of user screen time, so I only send updates using Twitter and email updates now. Plus I feel more virtuous not using Facebook and LinkedIn because I kind of hate them both, while I’m only indifferent to Twitter. From Toxic Waist: “Re: HIMSS19 slogan of ‘Champions of Health Unite.’ What do you think about it?” My kneejerk reaction: (a) they are misunderstanding or misusing the word “champions;” (b) attendees are mostly interested in the profitable business of healthcare rather than the human state of health; and (c) “unite” suggests that HIMSS19 is the convener of every one of these champions when clearly it is not. It’s tough trying to come up with a slogan that attempts to describe the wildly varying healthcare interests of a diverse group, but even more to come up with something that doesn’t sound overwrought or downright stupid like 2011’s “Linking People, Potential, and Progress.” I’ll admit that “Getting You To Buy Stuff With Patient and Taxpayer Money,” “Shouldn’t We Be Disrupted By Now,” and “We Have Booth Swag, Parties, and Vendors Faking Respect So You’ll Feel Important” fall a bit short of lofty. I worry about making decisions without adequate input, so please take a few minutes to complete my once-yearly reader survey. I will not only be happy, I will align our incentives by dropping your name into the Excel-powered randomization hat for a $50 Amazon gift card. I sneaked a peek at the reader survey responses in which someone once again suggested that I review big announcements from the past to see how many panned out in historical context. I like the idea, but I don’t really know how to do that effectively (by date? by company?) Your thoughts are welcome. I was just thinking this week about IBM’s giant announcement from a few years ago that it was rolling out a ton of healthcare apps that I suspect either failed or were never actually finished. The most common recommendation that poll respondents have for Apple in terms of healthcare is to stay away, followed by continuing its present efforts to develop health sensors and data collection. The only other significantly chosen option was to display and integrate information from multiple systems and providers. Only 6 percent agree with stock picker Jim Cramer that Apple should buy Epic or Cerner, and even then I bet those were pot-stirrers who just want to see what would happen. New poll to your right or here: what will you be doing during HIMSS19? The story on hospitals running “wealth screening” reminds me of how confused I was in an early hospital job when I first heard about “the foundation.” Its well-paid SVP had a lot of fingers in the operational pie. He was always out in the community schmoozing movers and shakers using paid-for memberships in the best clubs, coordinating black-tie galas, and cozying up with vendors that we were trying to keep at arm’s length (“I’m not telling you to buy Siemens PACS, only that you tell me why not if you don’t,” he said right before jetting off with some of his hospital cronies to Germany for a junket that Siemens was paying for.) I was naive that hospitals are run pretty much like any big business, work community relationships to their advantage, play community doctors like a chess game, and plan endlessly on how to get bigger. My naiveté was also shattered the first time I saw how differently we delivered care to bigwigs in beds compared to mere mortals. Listening: new from Long Beach, CA’s Rival Sons. Hard rock will eventually return to popularity and this band will be waiting. 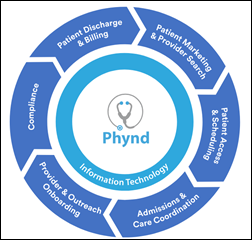 Phynd raises $8 million in a Series B funding round, with three of the four investors representing health systems. The company will invest the proceeds in increasing its its collaboration with Epic and other EHR vendors and to further develop its provider enrollment, management, search, and reporting platform. MassHealth selects Waystar’s Whole Patient Insight risk scoring of social determinants of health risk. Four agencies of Vermont Care Partners choose Netsmart’s full solution suite to support their work in mental health, substance use, and developmental disability. Phelps County Regional Medical Center (MO) will go live with American Well telemedicine in March 2019. Hayes Green Beach Memorial Hospital (MI) switched from Meditech to Epic in December 2018. Eureka Springs Hospital (AR) replaced Healthland (a CPSI Company) with Medhost in January 2019. Bienville Medical Center (LA) switched from Healthland (a CPSI Company) to Medhost in December 2018. Scotland Health Care System (NC) is implementing Epic. A federal judge in Madison, WI rules that Epic’s mandatory employee arbitration clause is valid, denying the complaint brought by lawyers of current and former Epic employees that the US Supreme Court’s decision in favor of Epic was unconscionable. An Iowa man is surprised that a hospital’s policy prevents him from viewing his 12-year-old daughter’s medical records without her consent. State law supersedes HIPAA and some leave it up to individual hospitals to decide the age at which the parent can’t view the child’s records without their permission, with the requirements intended to encourage adolescents to be honest in their conversations with providers about substance use and sexually transmitted disease. 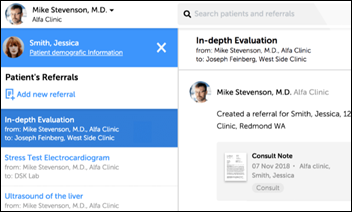 GeekWire profiles Vyrty’s Sync.MD, which claims to empower patients by letting them take phone photos of their medical records (how they get those is breezily unstated), store them, and then selectively share them with providers to whom they provide a QR code. Doctors can print records to a virtual printer to add them to the patient’s file, which is a good idea. The CEO’s LinkedIn (which shows zero healthcare experience) says the company’s technology involves a smart card, so there’s probably a pivot in there somewhere. Unstated in the brochure-ware is that (a) patients don’t want to screw around collecting and managing their own records, as evidenced by both Google and Microsoft failing to impose their personal health record apps on the world; and (b) clinicians don’t trust patient-managed records because they can’t tell if they are complete and it’s easier to just start firing off orders for a barrage of revenue-enhancing tests and imaging studies. Technologists who have no healthcare experience always fail to understand that hospitals and practices don’t trust the records of their peers, rightly or wrongly, and fear the legal consequence of acting on them inappropriately. 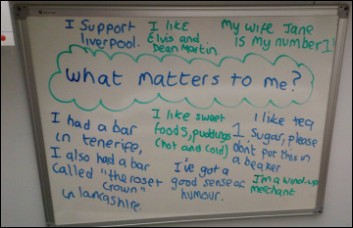 My personal experience is that dentists are a lot more interested in the records of new patients than doctors. Four men sue Texas Children’s Hospital for age discrimination, alleging that the hospital fired them from their senior computer operations analyst IT jobs by requiring them to earn Microsoft or Cisco certifications that were unrelated to their job responsibilities, then replaced them with younger employees who didn’t hold those certifications. The New York Times notes the odd phenomenon in which Millennials – a generation that is perceived by many to be lazy and entitled — claim they can’t wait for Monday mornings and brag online about how long and hard they work in the “hustle culture” that glorifies ambition as a lifestyle. Experts note that most of the people beating that particular “work is life” drum are shareholding owners and managers, not the workers themselves, and they are insisting on harder, longer workweeks despite data showing that it doesn’t improve productivity or creativity (a la Elon Musk’s push for worker bees to put in a sustained 80-hour workweek peaking at 100 hours) is “grim and exploitative.” Allow me to say from vast experience as a wage slave and overseer of wage slaves – your employer cares only about executives and shareholders, not the breathing, interchangeable widgets that fill cubicles in a modern version of the dehumanizing assembly lines of the early Industrial Revolution. Your life is being wasted if it consists of working for someone else and spending your tiny bit of free time staring at your electronica and cocooning with Netflix. It’s an old but wise adage that nobody’s tombstone says, “I wish I had worked more” and you will see exactly how one-sided the value equation is when your beloved employer marches you out, demotes you, or reorganizes you. If you want to work that hard, make sure it’s your shingle, not a corporate one. Amazon is using the shopping habits of its customers to target ads, allowing a physical therapy center to aim ads at nearby Amazon customers who had purchased knee braces and a credit card company to push ads at users of competing cards. As a result, experts say Amazon’s ad business is worth $125 billion, with much of the revenue coming from companies willing to pay to have their ads appear next to competing products found in customer searches. An investor calls it “insane scale” when companies can target new parents based on Amazon-stored baby registries or their exact car model entered in its “Garage” section. Amazon can also track user movement among non-Amazon sites to determine, for example, that a diet book customer is now reading CNN and might be profitably invited to buy protein bars. 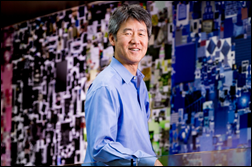 Microsoft’s top healthcare executive, corporate VP and computer scientist Peter Lee, PhD, acknowledges that his employer along with Google have failed in their healthcare efforts, noting that when Satya Nadella asked him to take the job, he was doubtful: “The tech industry is littered with attempts by shiny CEOs to go after a piece of this massive healthcare pie. I think pretty consistently the tech industry has gone into it with a lot of naïveté, even some arrogance. So my knee-jerk assumption was ‘Here we go again.’’” He seems to be focusing on storing genetic data. Federal agents arrest a California nurse for running an online pharmacy that sold 20,000 opioid pills. 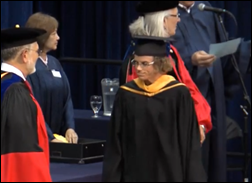 Carrie Markis, who earned a master’s degree in nursing science and healthcare leadership from UC Davis in 2013 (I found her in the school’s graduation video above), told customers in Dark Web chats that she buys drugs from people who resell their prescription meds for cash, eventually netting herself several hundred thousand dollars. On the bright side, reviews of her online store were nearly all five stars. Pay someone to swap seats if you end up next to this guy on a plane. 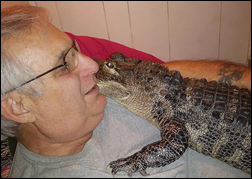 A Pennsylvania man suffering from depression registers his alligator Wally as an emotional support animal. His mood won’t be boosted much when Wally rips his arm off. 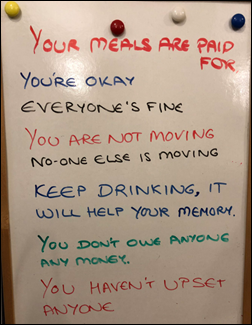 I love this – general practitioner Phil Grimmer, MBChB of Chippenham, Wilthsire, England tweets a photo left by a woman in the room of her mother who has dementia to reassure her about her surroundings. 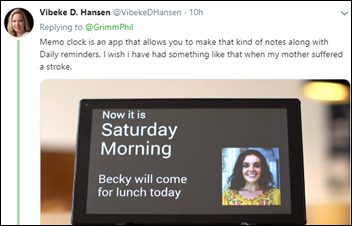 His tweet went viral with over 1 million views, encouraging others to post their own signs and stories for loved ones or patients under their care for cognitive impairment, either to give them comfort or to help caregivers address them in familiar ways and to treat them as people rather than patients. Mobile Heartbeat will exhibit at the San Diego ANIA Regional Conference 2019 February 1. Netsmart will exhibit at the NY Coalition for Behavioral Health Annual Conference January 31 in New York City. Clinical Computer Systems, developer of the Obix Perinatal Data System, will exhibit at the AWHONN South Carolina Section Conference January 30 in Columbia. Experian Health will exhibit at HFMA MidSouth January 30-February 1 in Tunica, MS.
Wellsoft will partner with integration vendor Interface People to offer an ED solution for Meditech customers. I was distinctly underwhelmed by the BI piece on Peter Lee, a Microsoft VP. It seemed both good and appropriate that he brought some humility to the table concerning Microsoft’s ability to create a viable healthcare business offering. That said, what is the new plan? HealthVault indeed went nowhere, so what is the value add? The article suggests only that “genetic data storage” is the answer, or part of the answer. Nope, not even close! While a full gene sequence does indeed take up quite a bit of space, data storage is both cheap and easy. Microsoft has such a service but it’s hardly unique. Nor is it very special. If you were to start talking about genetic analysis, now you might have something. A service built on (for example) SQL Server, Azure and PowerBI. That sounds like the beginnings of something interesting. You still have to address the desirability of Microsoft to provide this though. What is the appeal? Citizens and consumers might be more comfortable doing this kind of thing via health networks. Those organizations have expertise in ethics, privacy and patient’s rights. Another competitor are the commercial genomics services. They specialize in genetic testing, low cost and genetic analysis. Mr. Lee is still a long way from defining a convincing business case. You’ve summed up my life in one devastating sentence, thanks. But I disagree with your conclusion, because I’m lucky enough to be working on meaningful projects that actually make hospitals run more efficiently. That work is it’s own reward. 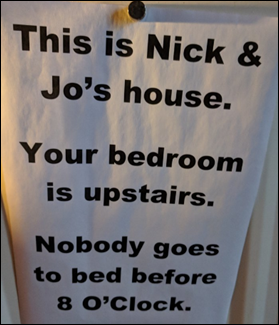 Just wait until you hit the magical age when you, too, can be judgmental when (younger) people spend their free time in ways that don’t align with your personal values. The main takeaway of don’t live for your employer is still true, though.